Confidence from consult to courtroom is the goal. Performing over 50 jury trials ranging from the simplest of misdemeanors to Murder in the First Degree, gives me the range of experience to help with your particular charge. Exercising that right is the first step to minimizing the consequences, hiring me is a good second step. The fee to represent you depends on the charge(s) you are facing. You have the right to a speedy trial, which according to Washington Criminal Rules means: within 60 or 90 days of your arraignment, the latter being if you are reading this message on your home or office computer. It is an 8-hour day of outdoor labor for the state or city, done instead of jail time. It is a type of jail sentence that allows you to continue with your current employment if certain qualifications are met. What if police found evidence in my home or car or pocket? Both the Washington and United States Constitutions protect you against “unreasonable” searches and seizures. If the search or seizure in your case appears illegal, a suppression hearing will be held wherein a Judge hears both sides and either rules the evidence admissible (i.e. Prosecutor can use at trial, and you can appeal the Judge’s ruling) or inadmissible (i.e. evidence cannot be used at trial, and case is frequently dismissed). For those not wanting to run the gauntlet of a jury trial, a lawyer trusted by both Prosecutors and defendants is necessary to negotiate your best deal. Did you know that you can commit a felony, and still end up without a conviction on your criminal record? Ask about diversion. Did you know that you can drive under the influence and not have your license suspended? 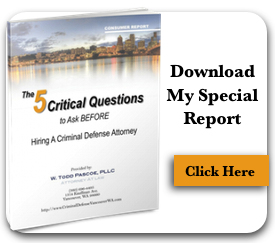 Ask about deferred prosecution. Did you know that you can plead guilty and feel confident that the Judge will not put you in jail? Ask about work crew or electronic home confinement. Did you know in most cases, Prosecutors do not want you to lose your job, and will recommend your jail time be served on work release? To discuss these matters and all of your other questions, please schedule an appointment today.